From this angle it looks like we have a handle on life and impending festivities, but the truth is this has been a difficult week and it's not getting much easier. Never underestimate the effects of Santa Ana Winds, raging fires, evacuations, clean-up, and traveling the road back to Normal. In the midst of our own little dramas we are trying to cope with other people's agendas... like school parties on steroids. And then there are family matters that arise and make all else pale by comparison... so, I dropped everything to try to comfort my cousins in L.A. Sigh. Truly, this is not me complaining. I am just taking stock of all the factors that may account for my lack of sleep, for feeling stressed, sad, melancholy and well, frankly, irrationally cranky and sometimes even rationally cranky. The boys are just... ahem... a wee bit late for school. What can I say? 1. Geoff put gas in the car before I made the sola trip to L.A. This is romantic, kind, thoughtful, helpful and comforting. 2. I got to see my cousins and Grandma, aunt, uncle, tio, and my brother Bill. Time with family is precious. 3. When I came home everyone was happy and safe and I was overcome with the knowledge that I love this family with my heart, soul and mind. 4. Dominic learned to walk. Sure, I am missing the fun of actually seeing him walk, but at least I got to see Bill impersonate his son walking. Cute. Cute and funny. 5. 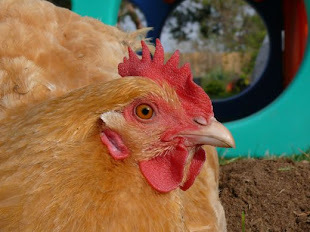 I have been hearing from family and friends and new Chickenblog visitors, and I love the conversations and exchanges. Love it. 6. Tracy says I make her smile and she handed me an award for it. I wish I could sing, but making people smile is also a sweet skill. Tracy makes me smile too. 7. Frozen, nitrate-free turkey sausages are on sale. 8. I finally found my cell phone... to 21 people: Sorry I missed your call! 9. 21 people called me. OKay, some of them were recorded messages from the school district. 10. Did I mention how much I love my family? It bears repeating. I love their laughter, creativity, thoughts, actions, dreams, plans, goals, motivations, smiles, drawings, carvings, dances, songs, music, style and hugs. So much joy there in your family, so many incredible things going on, so much love, so much talent, so much caring -- no wonder home is the best place to be. I don't want to risk sounding trite or coming across as insincere -- I cannot pretend I know what you are going through and yet I want to wish for you the toe-holds, the little places to grip on to that feel good and hopeful and fulfilling, and know that the other stuff will eventually be done with. Hugs going out to you and your family. Thank you so much for visiting my blog :) Love the pumpkin pic! That reminds me...Halloween is tomorrow and I haven't carved my pumpkin yet LOL. A wonderful wonderful list, Natalie. I'm glad you got to be a comfort to your family during this stressful time. You sound just a little bit overwhelmed but seem to deal with it all with a great sense of humor. Making lists like that has gotten me through some tough times. Having a supportive family helps too. Things will get back to normal.